Paul enjoys using a secondhand Record 043 or 044 plough plane, however these are no longer in production as new models but so far they have been readily available via eBay. You can sometimes get a good secondhand deal on eBay for a Stanley 13-030 or similar plough plane and these work very well too, they range from £50-70 depending on what is included. You can expect to pay up to £125 for a secondhand plough plane if it comes with a full set of cutters. You only really need 4 blades to start with, the ¼”, 5/16”, ⅜”, ½” , you can add to your collection over time, but it can become expensive to buy blades separately. Not all blades across the different models will fit all plough plane types, be sure to check it is compatible. If not, however, they can sometimes be adapted. If you prefer to buy new, the Veritas plough plane matches the Record planes in terms of quality, functionality and comfort and is more accessible. You can buy plough planes secondhand, just be sure to check they don’t need extensive refurbishing unless you feel confident enough to do so. The blade might need sharpening if it is second hand, you can learn how to do this in our setting up and sharpening guides. 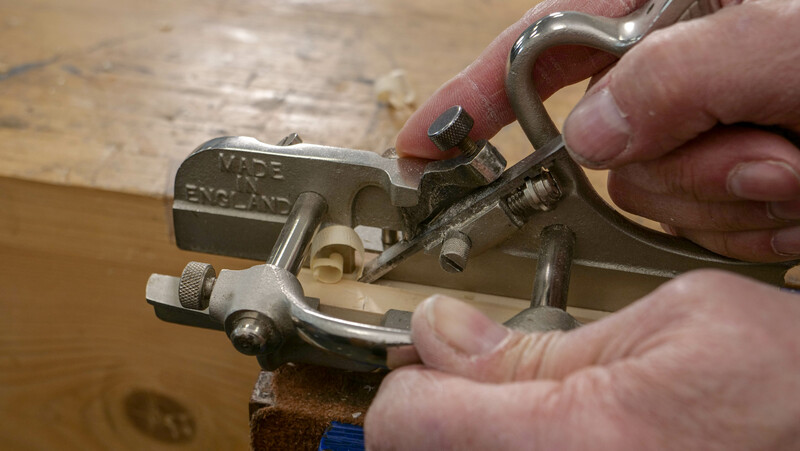 As this is a lifetime tool, it costs more than other tools which have a shorter life, you can expect to pay around £165 for a new Veritas small plough plane. We purchased this from eBay for £55.00* with £5.00 delivery.